Welcome - Association Evaluation LLC. 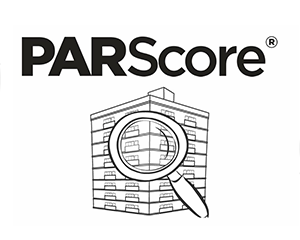 PARScoreTM is the only product that gives you a complete, under-the-hood look at both the financial and physical health of your condo or homeowners association. PARScoreTM reduces risk and provides a comprehensive assessment of the health, safety, security, and creditworthiness of a condominium or homeowners association. PARScoreTM evaluates hidden liabilities that can affect investment decisions--and save you thousands of dollars. The proprietary fact-based standardized analysis and rating system saves both time and money. Data is collected from association records, on-site inspections, corporate filings and other databases. The numbers are calculated using an algorithm that analyzes more than 140 data points plus thousands of public records. Lawsuits, house rules, bank balances, special assessments, rent policies, owner occupancy ratios, and the board’s policy on conflicts of interest are a few of the items examined in detail. A financially solid and well run association is a smart investment. We obtain records and complete a summary review of annual income, amount in reserves, percentage of annual income allotted to reserves, and other critical documentation. 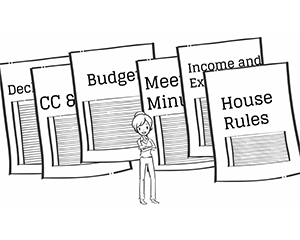 We review the official minutes of association meetings to identify concerns and risks. We document the history of special assessments levied by the association for special conditions that have arisen. We identify liability and risk related to past lawsuits against the association as well as pending litigation. We dispatch trained professionals to detect any visible safety or maintenance concerns in the associations common elements. We provide photographs to keep a visual record of common elements and any nearby external hazards. A higher PARScore score indicates a financially stable association where a low score suggests that caution be used. 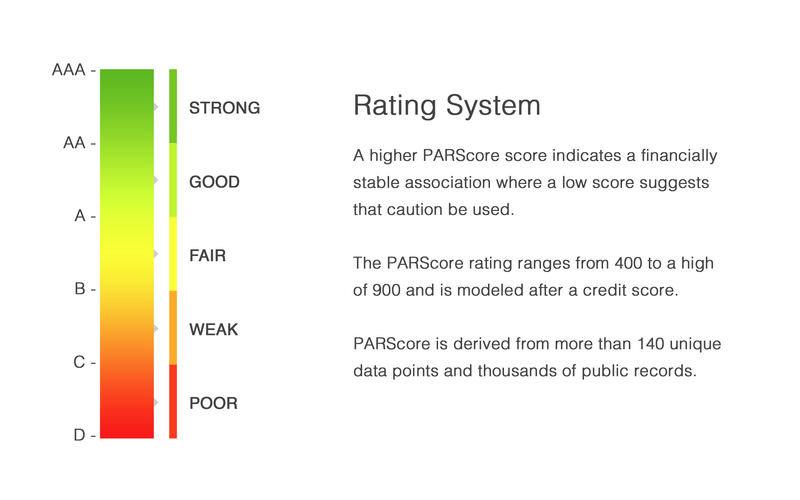 The PARScore rating ranges from 400 to a high of 900 and is modeled after a credit score. PARScore is derived from more than 140 unique data points and thousands of public records. 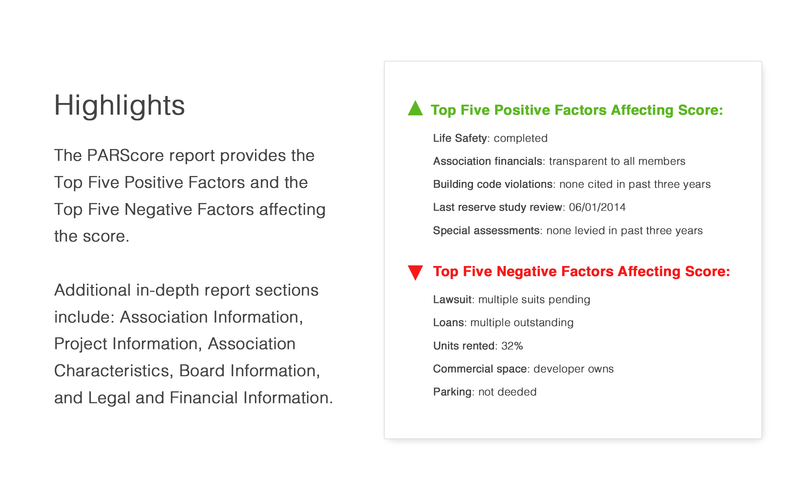 The PARScore report provides the Top Five Positive Factors and the Top Five Negative Factors affecting the score. Additional in-depth report sections include: Association Information, Project Information, Association Characteristics, Board Information, and Legal and Financial Information. 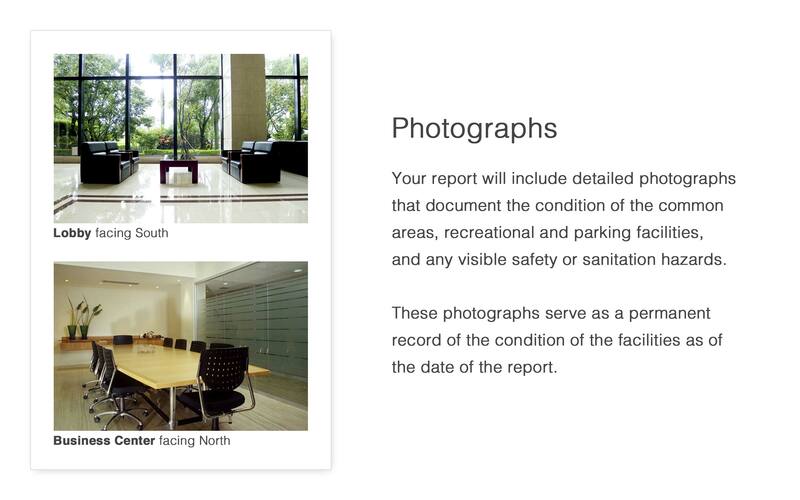 Your report will include detailed photographs that document the condition of the common areas, recreational and parking facilities, and any visible safety or sanitation hazards. These photographs serve as a permanent record of the condition of the facilities as of the date of the report. 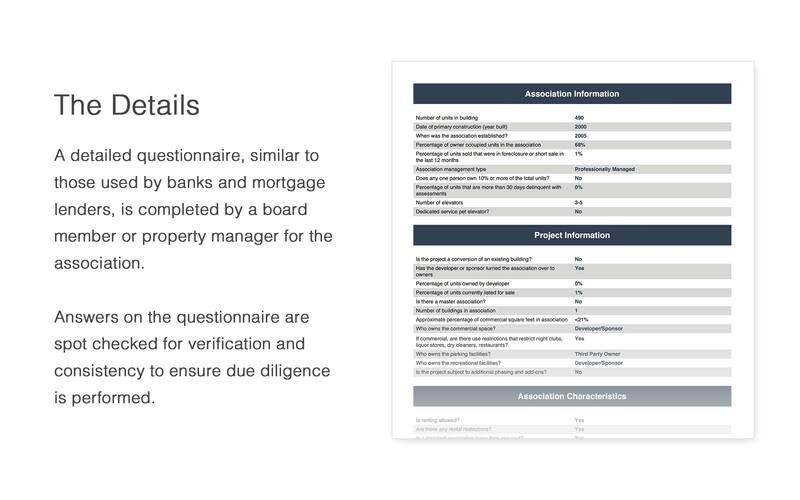 A detailed questionnaire, similar to those used by banks and mortgage lenders, is completed by a board member or property manager for the association. Answers on the questionnaire are spot checked for verification and consistency to ensure due diligence is performed. Pricing is based on the number of units in the association. The more units in the development, the more common elements need to be evaluated and more time is spent reviewing all of the pertinent documents for the association. "I wish I had a PARScoreTM when I purchased. It would have saved me so many headaches—and so much money." "Transparency is what PARScoreTM is all about. Teams have conducted numerous field studies in Chicago. The results were shocking in terms of inspecting the associations and identifying troubling data." "PARScoreTM asks serious questions. If the building was built in 1929, when was a new roof last installed? When was tuck-pointing done? When were the windows resealed or replaced? PARScoreSM puts meat on the bones of an incomplete appraisal. You have everything covered—by category and rank. It’s a slam dunk." Supplier, upon acceptance of an Order placed by Buyer, will supply the products and services specified in the Order (the "Work") to Buyer, pursuant to the terms and conditions of this Agreement and its exhibits and Supplier's acceptance of such order submitted by Buyer is expressly limited to the terms and conditions of this Agreement notwithstanding any contrary provision contained in Buyer's purchase orders, invoices, acknowledgements or other documents. The details of the Work (e.g. quantity, price, timeline for delivery and product specifications) shall be set forth in the relevant Order. Buyer, upon acceptance of terms and conditions, agrees to opt-in to receive Supplier’s monthly newsletter sent to Buyer’s email account registered with Supplier. (a) The prices payable by the Buyer for goods and services to be supplied by Supplier under this Agreement will be specified in the applicable Order. (b) Buyer agrees to the prices outlined in the Order when Order is initially submitted. (c) Buyer has a maximum of twenty-four (24) hours to cancel an Order. All sales are final after twenty-four (24) hours from time-stamp of Order Acceptance by Supplier. (d) Buyer authorizes the capture of the entire value of the Order at the time of Order submission. (e) Pricing schedules are based on the community-type designated in Order and confirmed by Association Evaluation professionals. (f) Pricing schedules are subject to change at any time, and are not published. Questions regarding pricing of a future order can be directed to Customer Service. (g) All completed Orders will be delivered to the e-mail address provided upon Order submission. (a) Buyer represents and warrants that any matter it furnishes for performance of services by Supplier (i) does not infringe any copyright or trademark or other Intellectual Property Rights of any third party; (ii) is not libelous or obscene; (iii) does not invade any persons right to privacy; and (iv) does not otherwise violate any laws or infringe the rights of any third party. (b) Buyer warrants that it has the right to use and to have Supplier use on behalf of Buyer any data provided to Supplier or its Affiliates by Buyer including specifically customer names, identifying information, addresses and other contact information and related personal information ("Data"). Buyer further warrants that it will designate on the applicable Order if Data provided pursuant to that Order is subject to Gramm-Leach-Bliley or other statuses providing enhanced data protection or requiring enhanced data security procedures. Buyer acknowledges and agrees that, in acquiring the data and information from the Order, it is not entitled to any license in any intellectual property rights in the Content or the Data Products and that the Seller is the exclusive owner thereof. Buyer undertakes not to reproduce or quote any Content or any table containing any Content as a whole, or in any part, whatsoever. Buyer shall not publish, reproduce, distribute by sale or otherwise, communicate or disseminate to the public, extract from or revise the content of, or use for any commercial purposes or modify the Content, in whole or in part, in any way, in any form and by any means. Buyer acknowledges and agrees that the Content received constitutes confidential information, which it undertakes to keep secure and hold in confidence and, unless required by law, it shall not make the Content available to any third party or use the Data for any purpose other than for exclusive usage by the Buyer. Buyer shall take all reasonable steps to ensure that any officer, director, employee of Buyer and/or any other natural person acting for or on behalf of Buyer shall not use the Content otherwise than in accordance with the terms of this Contract and Buyer shall indemnify Seller for any damages resulting from such breach. Any and all inventions, discoveries, patent applications, patents, copyrights, trademarks and trade names, commercial symbols, trade secrets, work product and information embodying proprietary data existing and owned by Buyer as of the date of the Order or made or conceived by employees of Buyer during the Term of the Order shall be and remain the sole and exclusive property of Buyer provided that Buyer grants to Supplier a license to use, display and distribute (and to sub-license its affiliates and sub-contractors to use, display and distribute) any intellectual property rights delivered to Supplier as reasonably necessary to perform any Order. Any and all inventions, discoveries, patent applications, patents, copyrights, trademarks and trade names, commercial symbols, trade secrets, work product and information embodying proprietary data existing and owned by Supplier as of the date of the Order or made or conceived by employees, consultants, representatives or agents of Supplier during the term of this Agreement shall be and remain the sole and exclusive property of Supplier. Without limiting the generality of the foregoing, the parties agree that Supplier will own systems (including all web source code) related to the Services provided hereunder, including all modifications, upgrades and enhancements thereto made during the term of the Order. Any information that parties receive or otherwise have access to incidental to or in connection with this Agreement (collectively, the "Confidential Information"), shall be and remain the property of the disclosing party. Confidential Information shall not include information which: (i) was in the possession of the Receiving Party at the time it was first disclosed by the Disclosing Party; (ii) was in the public domain at the time it was disclosed to the Receiving Party; (iii) enters the public domain through sources independent of the Receiving Party and through no breach of this provision by the Receiving Party; (iv) is made available by the Disclosing Party to a third party on an unrestricted, non-confidential basis; (v) was lawfully obtained by the Receiving Party from a third party not known by the Receiving Party to be under an obligation of confidentiality to the Disclosing Party; or (vi) was at any time developed by the Receiving Party independently of any disclosure by the Disclosing Party. Confidential Information may be used to the extent necessary to perform this Agreement and the parties shall not disclose Confidential Information to any third party, except to its agents (who have executed confidentiality agreements containing terms substantially similar to the terms) as necessary to provide the Work hereunder. In no even shall Buyer acquire any right, title or interest in and to any product or process information, including related know how, either existing or developed during the course of the business relationship with Supplier and Buyer, and in no event shall Supplier acquire right, title, or interest in and to any materials or information provided to it by Buyer. The indemnifying party, as Indemnitor, shall indemnify, defend and hold harmless the indemnified party, as Indemnitee, its officers, directors, employees, agents, subsidiaries, and other affiliates from and against any and all claims, damages, liabilities, and expenses (including attorney fees) arising from any third-party claim based on Indemnitor's (or its agent's) breach of any representation, warranty, covenant, agreement, or obligation under the Order or this Agreement , or Indemnitor's (or its agent's) grossly negligent and/or willful acts in carrying out its obligations under the Order or the Agreement, provided that in no event shall Supplier be responsible for any claims arising out of its compliance with instructions, requirements, or specifications provided by or required by Buyer (including the use of information, artwork, logos, and/or trademarks provided by Buyer). Neither party will be responsible for indemnifying another party hereto where the basis of the indemnity claim arises out of such other party's own negligence or willful misconduct. In order to avail itself of this indemnity provision, Indemnitee shall promptly provide notice to Indemnitor of any such claim, tender the defense of the claim to Indemnitor, and cooperate with Indemnitor in the defense of the claim. Indemnitor shall not be liable for any cost, expense, or compromise incurred or made by Indemnitee in any legal action without the Indemnitor's prior written consent. In addition to all other rights to which a party is entitled under this Agreement, if either party breaches any term of the Order or the Agreement, the non-breaching party shall have the right to: (a) terminate the Order immediately upon written notice to the other party; and (b) seek to obtain injunctive relief to prevent such breach or to otherwise enforce the terms of this Agreement. Failure to properly demand compliance or performance of any term of the Order or this Agreement shall not constitute a waiver of Supplier's rights hereunder and prior to any claim for damages being made for non-conformance or breach, Buyer shall provide Supplier with reasonable notice of any alleged deficiencies in the Work or performance under the Order or this Agreement and Supplier shall have a reasonable opportunity to cure any such alleged non-conformance or breach. Supplier warrants that the Work shall reasonably conform to specifications in all material respects. Supplier will not provide refunds for any Work conforming to specifications in all material respects. Other than the warranties set forth in this section, Supplier makes no warranty of any kind, expressed or implied or otherwise whatsoever, that the services performed or any items produced will be merchantable or fit for any particular purpose or use. In the event of any breach of any warranty specified in this provision, Buyer's exclusive remedy shall be that Supplier shall, at its option, refund any purchase price paid for such Work. Any notice sent pursuant to this Order or this Agreement shall be sent by email to the email address submitted upon initial Order submission by the Buyer. Notices will also be sent to the internal Messages portal within Association Evaluation's Website portal, accessed using the Buyer's registered login information submitted upon initial account setup. Notices are considered Received at the time they appear in the respective email and Messaging accounts of the Buyer. The Supplier is not responsible for any disruptions affecting the Buyer's access to their its messages and its messages within the Website portal. The Order and this Agreement shall be governed by the laws of the State of Illinois, without reference to conflicts of law principles. Any legal suit, action or proceeding arising out of or relating to the Order or this Agreement shall be commenced in a federal court in Illinois or in state court in Cook County, Illinois, and the appellate courts thereof, and each party hereto irrevocably submits to the exclusive jurisdiction and venue of any such court in any such suit, action or proceeding. With respect to any litigation arising out of the Order or this Agreement, the parties expressly waive any right they may have to a jury trial and agree that any such litigation shall be tried by a judge without a jury and the prevailing party shall be entitled to recover its expenses, including reasonable attorney's fees, from the other party. Neither party shall be liable for any failure to perform or delay in performance of this Agreement to the extent that any such failure arises from acts of God, war, civil insurrection or disruption, riots, government act or regulation, strikes, lockouts, labor disruption, cyber or hostile network attacks, inability to secure transport, or any cause beyond such party's commercially reasonable control.